Music by Jez Lowe, written as a soundtrack to the play of the same name by Kate Bramley. Somewhere to the north, sometime in the past or maybe the future, the oceans grow larger and more outspoken, the land gets smaller and more timid, its people fewer and more isolated. Memories and realities become legends and dreams. Things that they were once so sure of, are now just uncertainties and doubts. Everyday objects become icons, treasures become worthless. Yet in the patches of dry safety, there is love, laughter and ambition. 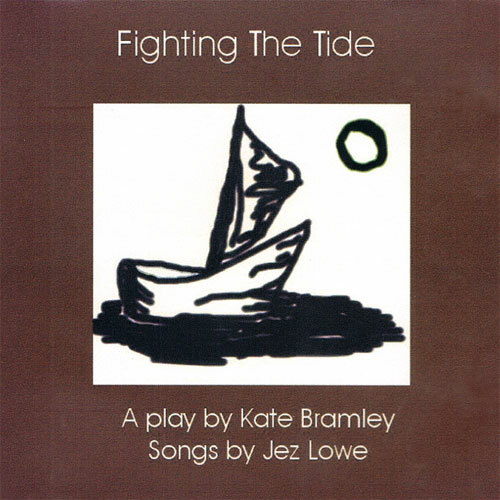 This album is a collection of songs written by Jez Lowe, as a musical commentary, a soundtrack if you will, to a play by Kate Bramley, entitled FIGHTING THE TIDE. The songs for the most part were never meant to exist beyond the play, and it wasn’t until they were being rehearsed and recorded for use as a backing track for the actors in the original production, that a decision was taken to make them available for further public scrutiny and, hopefully, enjoyment. Like the everyday objects that suddenly form the bizarre backdrop to the dramatic action, the songs took on a spirit beyond their original calling, creating new roles for themselves to suit the wishes and needs of those who heard them. Quite unexpectedly, they took on a life of their own. Kate Bramley’s play, FIGHTING THE TIDE, tells the story of two men forced by circumstance to leave the sparse security of their diminishing island home to try to earn a living in the unknown lands across the expanding oceans. It is from these oceans that they harvest their crop, as fishermen, albeit thwarted by the hard hand of capitalism even in these uncertain times. In setting out, they leave behind the wife of one of them to wait for an uncertain homecoming. Their wandering brings them into contact with friend and foe and almost classical traits of good and evil, and into battles both with the elements and with their own hearts. They find companionship in a woman, disguised as a man as in some traditional ballad, and cast adrift like themselves. Their journey forms the story of the play. Though each of these songs has a defined role within the narrative of the drama, for the purpose of this album these roles are no longer vital. Suffice to say that the story of the characters and their adventures is there if you wish to find it! Kate Bramley sings the songs written for the women in the play. Jez Lowe sings the rest, apart from one song, SHIPPERSEA BAY, that he wrote and recorded over 15 years ago, but which begged for inclusion in the story, and is here handed to Simon Haworth for his vocal interpretation. Kate and Simon (along with colleague Judy Dinning) are part of Jez Lowe’s band The Bad Pennies, but all are artists in their own right – Jez as a songwriter and soloist with twelve albums to his credit, Kate dividing her time between roles as a musician and as playwright/director and operator of the much lauded Bad Apple Theatre Company, and Simon’s reputation as instrumentalist, singer and songwriter can only be boosted by the imminent release of his second solo album later this year. Not heard on this album, but unquestionably vital in the process of bringing these songs to life, are the three actors featured in the original production, Isobel Pravda, Paul Parris and Brendon Fleming, the plays’ designer Ruth Paton, its technical stage manager John Bramley, and Neil Scarth who engineered and edited the recording of the music for both stage and album.